This kit represents a late production M4A1 Sherman with the larger 76mm gun and "wet" stowage. This tank first saw action in Europe in late July, 1944 with the Operation Cobra, when the 2nd and 3rd Armored Divisions spearheaded the breakout from the hedgerows during the Normandy Campaign. The tank was introduced to U.S. forces in Italy in August. The T-23 turret on this kit is the early version with the round loader's hatch and split cover. The later version of the turret has an oval hatch. You can achieve this with Verlinden's "Sherman Update Kit" listed below. Both types of turrets used the same commander's cupola. This is an old kit from Italeri but still ranks as one of the best. With some minimal work this kit can easily be brought to competitive standards. There are some ejector marks under the hatches and an occasional sink mark that need attention. The kit does provide periscope and headlight guards that, while thicker than their photoetch counterparts, are probably quite acceptable to the modeler who doesn't yet feel comfortable with using photoetch. Most modelers build this kit without the sandshield, which was rarely seen intact in the ETO. The kit includes one figure that, being to typical Italeri standards, is totally expendable. Adding DML's U.S. Tank Crew or even the more recent Tamiya tank figures is an inexpensive way to outfit your rig. Otherwise, there are many resin figures that will make fine additions. I have not yet built this kit, which has been surpassed by the DML "Operation Cobra" Sherman. But this article provides ways you can address its relatively few shortcomings in rough order of their significance. Along with the other usual references, you might want to pick up a copy of Military Modelling (Vol.32, No.7, June/July 2002) for Steve Zaloga's buildup of a "Cobra Sherman" (he recommends using pressed spoke wheels with the Italeri's suspension rather than original open spoke wheels). One "old wive's tale" that often comes up about the Italeri hull is that the sides are not vertically true. This is true  and they are not supposed to be true. Check out Kurt Laughlin's convincing article on this slippery slope. Barrel has inaccurate stepped-up section near mantlet. Replace with barrel from Jordi Rubio or Chesapeake Model Designs, or putty and sand the stepped area smooth. Do not use the replacement barrel offered by Elefant, as it is an exact copy of the inaccurate Italeri piece. Turret, mantlet, upper hull, and transmission cover lack texture. Use Gunze Mr. Surfacer 500, or Bondo thinned with Testors liquid cement, to add texture; be care not to overdo it, because Sherman texture is more flat and with shallow pits rather than raised and bumpy. Do not apply to rolled steel engine deck and lower hull. Tracks are stiff and springy. These smooth rubber block tracks are less common on late models represented by this kit. Replace with rubber chevron tracks from Tamiya's M4A3 or DML's M4A1, or the AFV Club set of individual links. RHPS hard-to-find steel cleat track is another option. Pistol port should not have seam. Use Testors Contour Putty or similar to blend seam where port frame meets turret. Pioneer tools are poor. Replace with others from Formations, Tamiya, Verlinden, or Collectors Brass. Antenna mount is British style. Replace with aftermarket item from Formations or Verlinden update set. Handles are missing on gas filler caps. Add with bits of plastic rod or sprue. Casting numbers missing from turret top and under transmission nose. Add numbers carved from sprue, or from KMC or Aber photoetch products. The air cleaners are less common round type. While these are acceptable, it was more common to see the square air cleaners that are found in Tamiya's M4 and DML's M4A1. There is an unused set on the M4 sprue of Tamiya's Breakthrough and 105mm Shermans. Or go with the resin version from Formations. .50 machine gun detail is soft. Replace with Tasca, Academy, Verlinden, or other kit spares from Tamiya products. Most late M4A1 Shermans had spoked wheels as supplied in the kit, but... You can use solid dished wheels. You can even mix solid and spoked, as was done when necessary repairs forced the use of whatever was at hand. Replace the kit's vertical suspension, with its upraised roller return arms. Tasca makes an excellent horizontal return arm suspension that accommodates the Italeri kit. Or pull the suspension found in Academy's M12 GMC. Remove the raised ridge at the end of the kit's barrel (you will still need to fix the rest of the barrel to get the appropriate taper). You can use a plain barrel with cap over brake threads (as in kit), or... Use a plain 76mm barrel or one with muzzle brake. Paint it olive drab, or... Go with black camo bands of paint as used by the 3rd Armored Division. Add a Cullin hedgerow cutter, available from Custom Dioramics or The Tank Workshop. Also, do not use the air vent dome on the back exterior wall of the turret. It was recognized in the mid-2000s that this feature was missing on the Cobra Shermans. If you want to build an M4A1(76)HVSS for a WWII diorama... You're skating on thin ice. According to Steve Zaloga, U.S. Army records indicate the M4A1E8(76) was built during the lates stages of the war and some were sent to Europe. But no photos have been found to show them in combat service. 76mm Sherman Gun Barrel (CMD 16D) - Metal gun tube, includes muzzle brake. U.S. Tank Tools w/Mounting Straps (CB0039) - Brass replacement tank tools. U.S. Pioneer Tools w/Mounting Straps (CB0043) - Brass replacement tools, such as shovels, axes, etc. .50 Caliber U.S. Machine Guns (CD 2003) - Resin and photoetch parts to make two guns. 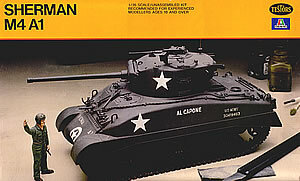 M4A1 Sherman (35339) - Another large assortment of photoetch details. U.S. 76mm M1A2 (TG-32) - Metal barrel includes both the flash suppressor and and threaded brake cap. U.S. 76mm M1A1 (TG-42) - Plain style barrel, without threads or suppressor, in metal. M4 Sherman (TTWD 105B) - Small fret of photoetch with such essentials as the periscope and headlight guards. T54E1 U.S. Metal Chevron Individual Link Track Set (RH04) - Link-to-link late war track with metal chevron. .50 Cal M2 Machine Gun with M31 Truck Mount (F3501) - Nicely molded gun in plastic. Sherman Update Kit (2024) - Offers periscopes, two antenna mount styles, dished road wheels, oval loader's hatch, and more. Pioneer Tools, Racks, Clamps (1476) - Resin and photoetch tools, straps and buckles, and racks for most U.S. AFVs. Cal .50 Machine Guns (1729) - Four resin guns with cradles and five spare ammo boxes. Much improved over more fiddly resin and photoetch set # 0372.